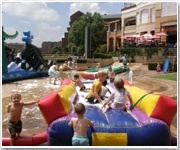 Centurion Mall Kids Entertainment: Free kids’ entertainment every weekend! Just a note of caution before leaving your kids at this mall. The security guards of Centurion mall recently assaulted a young white woman in a racially motivated a attack. I have called the mall management this morning to find out if the offending guards have been dealt with. I was told by the lady that They are still working there. I then asked her if it would be safe to leave my two boys at the mall for a movie. She then told me I should call mall security. She cant even give a straight answer! Sorry unacceptable. I am not leaving my children in the care of Of these racist security guards. As for Centurion mall's standpoint on this matter. It seems to be pretty clear that they approve this kind of behavior or maybe even promoting it. That sounds hectic Rudi. Well lets see what Centurion Mall will have to say about this. If they say anything at all. I am very sorry to the lady in question. From: Youtubeonfire-Watch movie online .